Written by Garrett W. on July 30th, 2016. 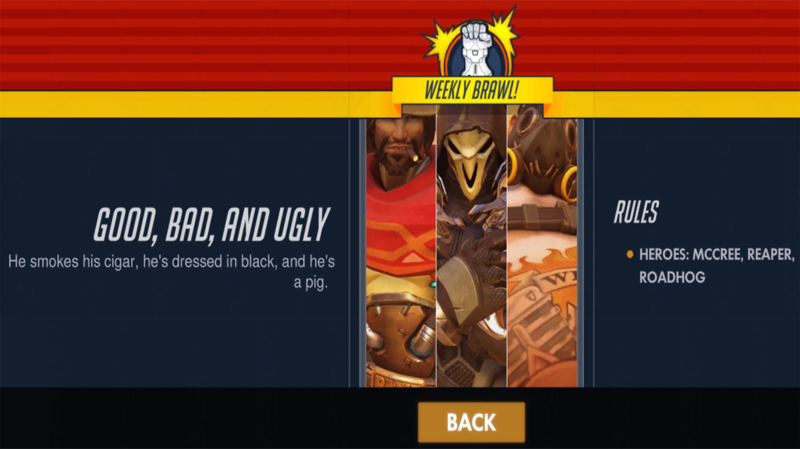 “The Good, The Bad, and The Ugly” is the title for this week’s Overwatch brawl. In this brawl, you play as either The Good, The Bad, and The Ugly, a.k.a McCree, Reaper, or Roadhog. These heroes all deal a lot of damage and have powerful abilities. To top it off, their ultimates are typically seen on the POTG highlights, as they deal massive damage and have high impact. “It’s High Noon” everyone, which means it’s time for a review. Reaper and Roadhog excel at dealing high damage at close range, while McCree is more focused on medium range. This means there are a lot of close range battles in this brawl. Besides damage, the heroes also have key abilities. McCree and Roadhog dish out stuns, and Reaper possesses escape abilities. This actually balances well, as you can counter other heroes with either a stun or escape. Most fights are actually duels as with these heroes, as you aren’t necessarily more powerful in a group. Bunching together will actually be the bane of your team, since grouping up against these heroes’ ultimates could prove fatal. Timing seems to be everything in this brawl, as if you can land a perfect ability, you will most likely win the duel. The only thing that doesn’t balance out is hero health. Roadhog carries a massive 600 HP, along with a self-healing ability. Sometimes I felt Roadhog was overpowered in this brawl, but when playing with or against skilled McCrees and Reapers, it worked out from their high damage output. As long as you can catch your opponent off guard, you can definitely win a fight as any hero, which I enjoy. I’m not the best aimer, so I tried to initiate surprise attacks to my advantage, and successfully did so several times. For those of you with great aim, this brawl will be a shooting gallery. I feel like The Good, The Bad, and The Ugly is designed around its name, but everything actually worked out well in terms of balancing. You typically see these three heroes in quick or competitive play, but encountering them paired up in this brawl really shows their strength. Also, the lack of healers requires you to constantly be aware because there is no one to save you. My rating for “The Good, The Bad and The Ugly” is a 3 out of 5. The gameplay plays out well and is pretty fun, but like many of the previous brawls, it isn’t very interesting or new. Though, I will give bonus points for the clever name.